Bankrupt shipyard Sainty Marine has announced that it has submitted a detailed restructuring plan to Nanjing Intermediate People’s Court. Under the plan, Sainty Marine will acquire a series of trust and power plant assets owned by its parent Jiangsu Guoxin Group through issuing new shares. In the meantime, the yard also released a debt restructuring plan to creditors to deal with total debts of RMB8.85bn ($1.32bn). 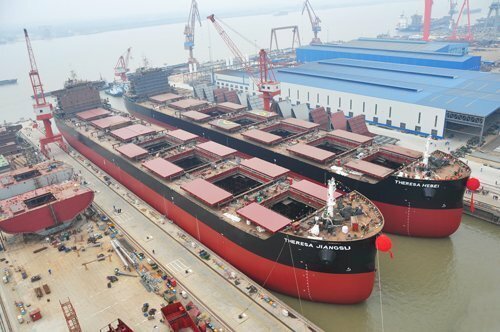 Sainty Marine will fully repay each debt below RMB300,000 ($45,000) by cash to creditors, and for debts above RMB300,000, the yard will pay off 10.56% of each debt by cash, and the remaining by new shares. The shipyard announced earlier this year that it was going to quit the shipbuilding business and had been trying to dispose of all its shipbuilding assets, however, all the three auctions of entire shipbuilding assets of the shipyard failed due to there being no bidders. The restructuring plan is still pending approval from the court.